I’m working on two cosplays for PAX East: Ravio from The Legend of Zelda: A Link Between Worlds and Lucina from Fire Emblem: Awakening. I just finished Ravio this week so I thought I would talk a bit about how I made this costume. There are five main components of Ravio’s outfit: the hood, the scarf, the robe, the belt, and the little bird Sheerow. Today I’ll talk about the robe, which was in some ways the simplest part of the costume. The robe was the first part of the costume I completed. 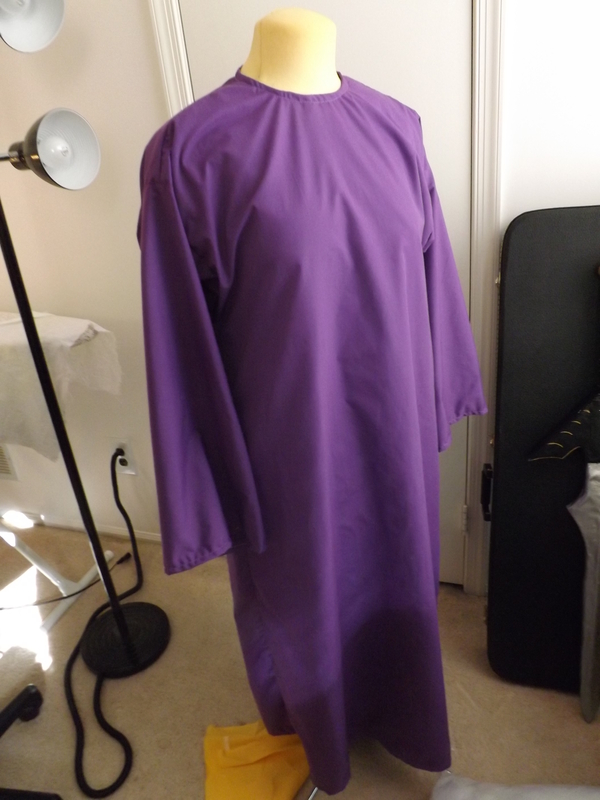 I chose a lightweight solid purple cotton from the quilting section of Joann’s, buying enough for both the robe and the hood (about five yards; I ended up having a bit left over but not too much). PAX East is in Boston in April, which means it’s usually still pretty cold at the convention. I wanted to be able to layer leggings underneath the costume, so I also picked out purple lining fabric to line the main body of the robe so that it wouldn’t bunch up on my leggings. I used McCall’s 2339 from the costume collection, which I jokingly referred to as the “Jesus robe pattern,” since it’s intended for use in religious pageants, as evidenced by the drawings on the envelope. The pattern is a simple sleeved robe with a slit in the back neckline that closes with a hook and eye. I originally intended to put a zipper in one of the side seams, but this was a lot easier. The robe turned out a little baggier than I would like, but I thought with the belt it would look fine. Later this week I’ll talk about the belt and the scarf.